An adult film actress who reportedly received a $130,000 payment from Donald Trump’s personal attorney shortly before the election has denied allegations that she had an affair with Trump or received hush money in order to keep quiet. 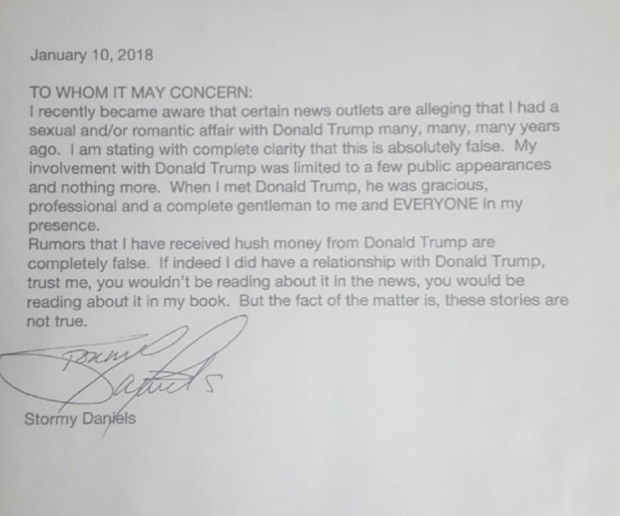 Trump’s personal attorney, Michael Cohen, released a Jan. 10 letter purportedly written by Stormy Daniels, a retired adult film star whose real name is Stephanie Clifford. Trump married his wife Melania in 2005. According to The Journal, which cited unnamed sources familiar with the matter, Cohen and the Trump team made the payment to Clifford after learning that she was preparing for an interview with ABC News to discuss her encounters with the Republican. The Journal reported Clifford’s contacts with ABC News back before the election. Its latest story includes the new information about the alleged payment arranged by Cohen. In response to the Journal’s story, Cohen denied the main allegations regarding an affair and hush money, though he did not address the existence of a $130,000 transaction involving Clifford. “These rumors have circulated time and again since 2011. President Trump once again vehemently denies any such occurrence as has Ms. Daniels,” Cohen said in a statement. He also provided a copy of a statement signed by the actress. “I recently became aware that certain news outlets are alleging that I had a sexual and/or romantic affair with Donald Trump many, many, many years ago,” Clifford writes in the letter, which Cohen provided to news outlets, including The Daily Caller. “Rumors that I have received hush money from Donald Trump are completely false,” she wrote. Attempts to reach Clifford/Daniels through her former attorney were not successful.